Would you know your teammates if you saw them at the box? 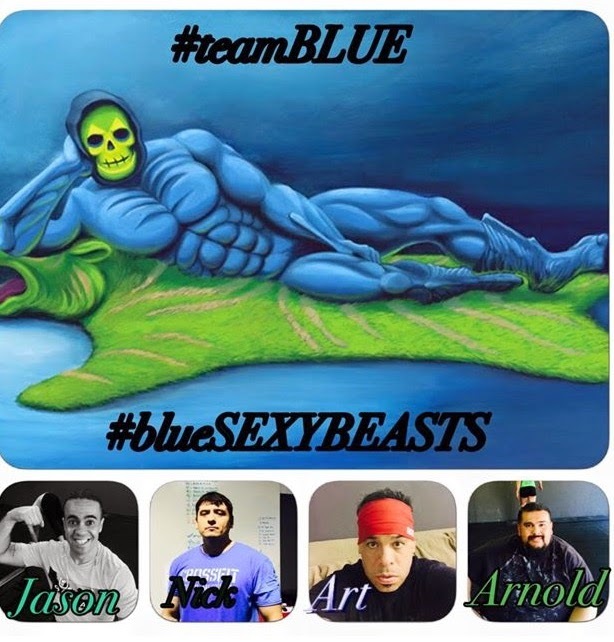 Here are 4 of Team Blue's Sexiest Beasts! For 1 point, post a favorite meat and how you prep it? Grass feed ground beef is my favorite, add onions, kale, sweet potato and I'm good to go. favorite meat is steak, seasoned and grilled. Team Orange! workout today: Strength 115, metcon:rx....woohoo! team orange! Elk tenderloin, seasoned with pepper, garlic and olive oil, grilled medium rare and served with grilled asparagus. probably have to say salmon - cooked in coconut oil with just salt and pepper served with celery and carrots stir fried in coconut oil as well. My favorite meat is some kind of steak! But since I'm on a budget if I have time I like to marinate chicken breast in a lot of chopped cilantro, garlic and lime juice and then bake or grill it! Yumminess!! My wod was awesome!! Getting stronger! 75# push press and 75# for the metcon. I like morning classes! I get in and out. All day to do as I may! Roasted whole chicken is about the only meat I have to prep... So I just stuff it with a whole onion and sprinkle Rosemary, thyme, sage, and garlic all over. Pop it in the over 400 for 45 min and usually it is done. If you like crispy outside, broil for the first 15 min. Beautiful!!! I love grilled salmon but I don't know how to grill. So my next favorite (I can do myself) would be pork chops. Just salt and pepper and fry with sesame oil. Done! All questions from yesterday should be answered. Let me know if any other questions by replying to this comment. Grass-fed NY strip on the grill. My steaks are the BOMB! Team Orange! Bacon wrapped chicken is my new favorite. I LOVe steak! I like to fry t-bone steak i marinated in lime juice with salt and pepper. Simple but tasty. My WOD was 95# push-press and 95# for the EMOM. I really like roasted brussel sprouts. I add olive oil, garlic salt and pepper. Then bake at 400 until they are nice and crispy. I've been adding carrots to the mix too and they get super sweet when you roast them. That bacon wrapped chicken sound super good! Think I'm about to do that. Chicken is my favorite paleo meat to make. Baked Salmon with sauteed zucchini and sweet potato. Salmon! Cedar plank on the grill. Salmon is my favorite meat. The best way to cook it is to marinate it and smoke it on cedar planks. Amazing! Today's WOD was super fun! Metcon: 65# I really wanted to work on my technique. Felt good! Endurance 5+3 w/ 12# ball. Steak is my favorite! Salt, pepper and grill. But I don't eat it often. :( too heavy. This carnivore loves steak. Add a little salt &pepper and I'll squeeze like juice on it as it cooks. Then I'll top it with red or green salsa. Love grilling chicken with just a little bit of sea salt, butter, and lemon. Prep it with avocado and veggies. Yum! Go team blue! Love that I'm getting to know more of my box mates with these challenges! If I didn't know my team members before, I'm getting to know them now! Marinated chicken, salt, peppered, and cooked on the grill. Lee's pork chops! Team Orange!!! im loving grass fed ground beef, in a skillet with salt and pepper!! yumm. Any meat on the grill and seasoned RX on the workout and Edurance! Buffalo ribeye with a some salt and pepper. My favorite meat is steak, marinated. My favorite meat is chicken, seasoned with Mrs.dash then cooked in a pan with coconut oil. My favorite meat is pork shoulder roast. Just season it with some salt and pepper, throw in a crockpot with some onions and bell peppers. Cook it through out the day while your at work and you will come home to a soft pork shoulder. Ground beef cooked in coconut oil with onion, tomato, and cilantro. My favorite meat is beef and I prep it many different ways but my favorite is chunks of beef with tomatoe, onion and jalapeño mmmm.